Digital transformation is changing the old paradigms and ways of managing suppliers. New collaborative models are disrupting and changing entire suppliers’ chains. Quality of supplier is becoming more important than the costs of provided services. What matters is an ability to actively innovate, collaborative style of relationship, where customer and supplier are working on mutual benefits. Course length: 1 day including the exam for certification. Price: 480 EUR 390 GBP 580 USD including the certification exam, VAT excl. Overview: This course presents a managerial level overview of the latest development in collaborative models and its impacts on the management of suppliers. Long-time used models based on Service levels definitions and regular reporting is bow extended by new approaches, where the quality of suppliers is analysed from opportunities created, new capabilities and innovations provided to the organization. Digital transformation projects are changing existing models, disrupting “this is how we do it for years”. Digital transformation has implications also to the ways, how organizations have to re-assess their actual IT suppliers into new ecosystems of collaborative networks, where the role of the supplier is moving from passive role (Request and control) to the proactive, ever-improving model Innovate and analyse. SFIA skill codes: Supplier Management SUPP 4-7, IT Contract management ITCM 4-6. Prerequisites: No pre-requisites, possessing the overview of traditional service delivery models is suitable, however, the course is providing the quick recap of frequently used models, before the new body of knowledge is presented to the delegates. Target group: For an IT manager, contract managers, team leaders, IT professionals with the focus on quality management. Course learning objectives: This course is aiming to extend course participants knowledge of existing models with growing fields of new, innovative ways how actively collaborate with the range of suppliers, how to evaluate the quality of suppliers and how to create mutual advantage through collaborative models. 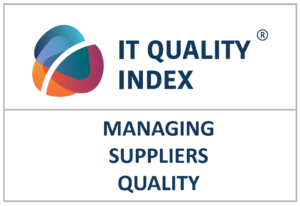 Key parts of the course are based on the IT Quality Index book and principles, plus selected parts of new norm ISO 44001:2018, and new models of collaborative networks. Innovate and analyse – testing new ideas, accepting uncertainty of results. CIO: Our organization used to apply very rigid and slow-moving process of working with suppliers, an enormous effort on our side and supplier side had to be invested to start contract, model designed in 90ties. As the speed of change is growing so fast, we managed to modify suppliers management rules and policies to enable working with smaller SME, even startups with untested solutions. Our suppliers’ management practices are now supporting all range of partners, where we categorize suppliers not just by price but also through quality criteria and opportunities created. The course is led by an experienced Accredited IT Quality Expert. The course is building on IT Quality Index practices. The course provides practical guidance on how to innovate relationships with suppliers in the era of digital transformation.